Back in 2010, London based publishing house Nobrow Press printed a 176 page, four color hardback anthology called A Graphic Cosmogony in which “twenty four artists take on seven pages each to tell their tales of the creation of everything...” and, thankfully, it's just recently come back into print. 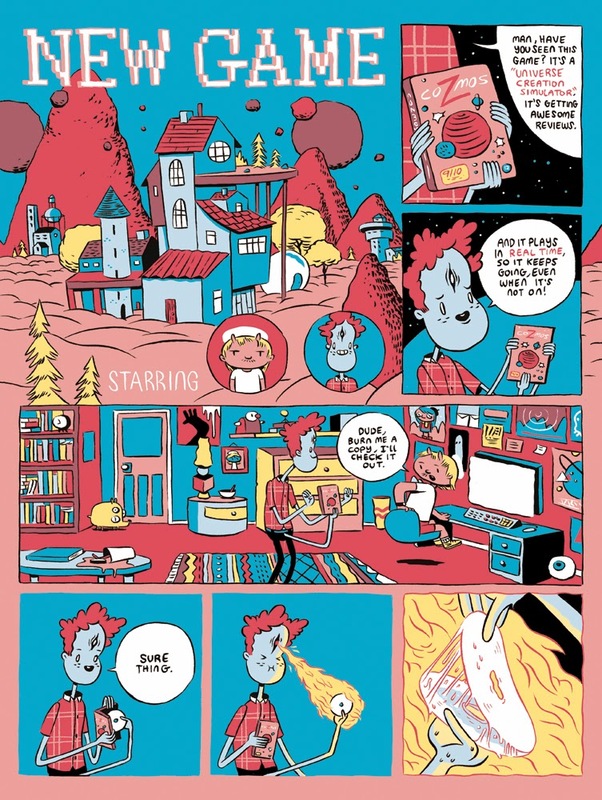 As with most Nobrow releases, A Graphic Cosmogony is a thing of beauty, elegantly crafted. The anthology hovers in that liminal space between an art book and a comic book, as each creator brings to their seven pages a unique understanding and depiction of the myth of creation. Ranging from the traditional to the surreal, profound to the comical, each presentation could exist as a mini-comic on its own. Put together, though, they gain a further layer of meaning through their juxtaposition, commenting, in a way, on the work that proceeds and follows. While some artists are more successful than others, taken as a whole each piece becomes a necessary part of the larger puzzle. Out of the cacophony and chaos implicit in twenty four voices singing their own interpretation of a similar theme, editor Alex Spiro and assistant editor Ben Newman craft a work that fills the room with a pitch perfect orgiastic canticle, a nuanced symphony to exult the senses. 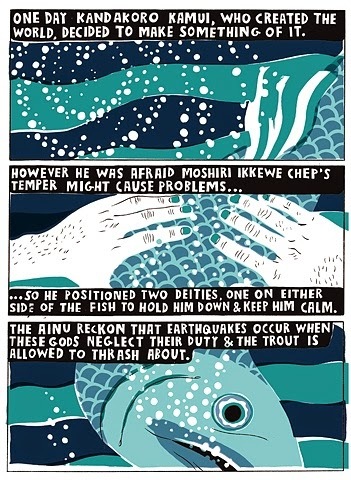 In his introduction to the anthology, Paul Gravett writes, “what better means than comics, the distillation of illuminated manuscripts, tapestries, meditational paintings and decorated scrolls and all of humanities’ narrative arts, to tell that oldest story of them all, the story of creation?” When artists deal with ideas surrounding creation myths, one can't help but see them commenting on their understanding of their own process as well, the fundamentals of creativity, the machinations of art, the work inherent in forming inspiration into product. As each artist tells their own myth of creation, they also give the reader insight into their own ideas about creating. 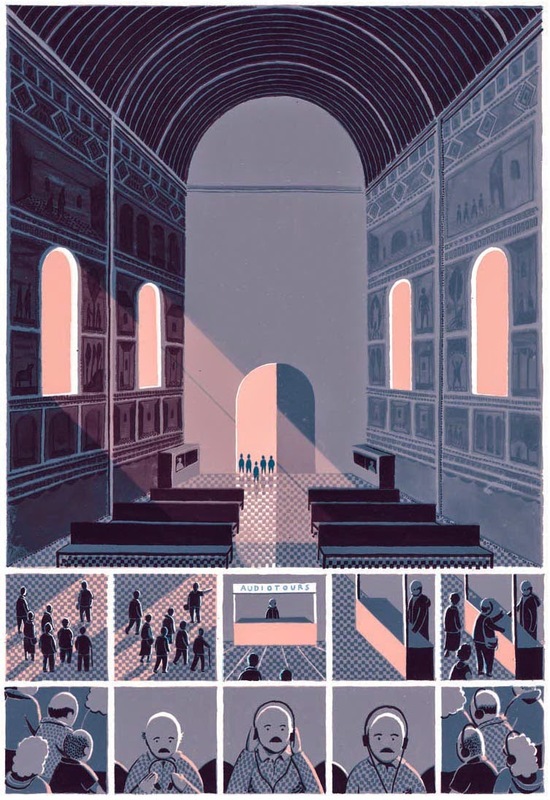 The list of contributors is impressive: Stuart Kolakovic, Mikkel Sommers, Brecht Vandenbroucke, Luke Best, Rob Hunter, Jon McNaught, Ben Newman, Andrew Rae, Luke Pearson, Jack Teagle, Jon Boam, Jakob Hindrichs, Clayton Junior, Daniel Locke, Isabel Greenberg, Mike Bertino, Nick White, Rui Tenreiro, Sean Hudson, Luc Melanson, Katia Fouquet, Yeji Yun, Matthew Lyons, and Liesbeth De Stercke. Each artist demonstrates their nuance of storytelling while also highlighting their particular style. The anthology speaks to the myriad possibilities comics have in terms of narrative, representation, tone, and craft. A Graphic Cosmogony is a book, first and foremost. The tactile experience of turning each thick page becomes integral to the experience of consumption. The very texture and weight of the paper and the push back of its tight binding make reading A Graphic Cosmogony so much more immersive then tapping on a tablet or scrolling with a mouse. Even its surprising lightness, given that it is a 176 page hardback book, makes reading the anthology a physical event. It's what Nobrow, as a publisher, does best. 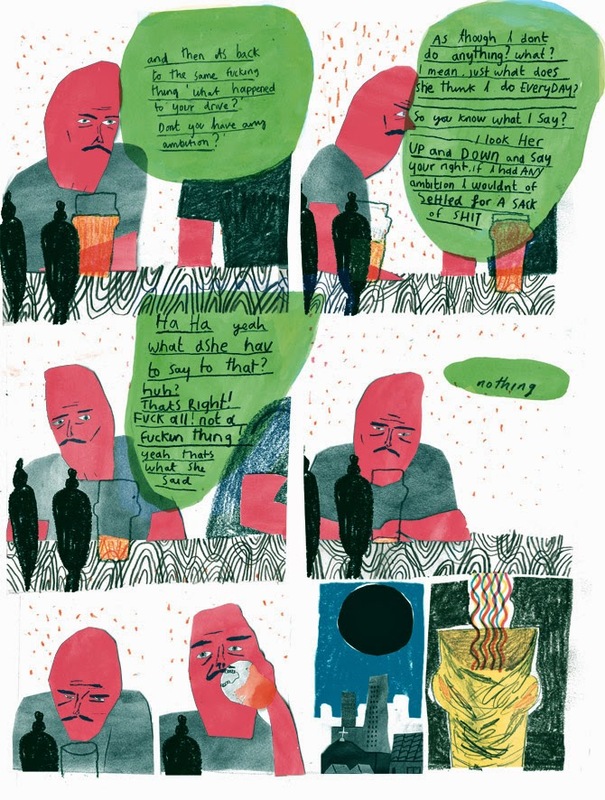 Paul Gravett ends his introduction to A Graphic Cosmogony by writing, “Pull up a rock and gather round the flickering fire - the universe is about to be born again…” This is a thing to enjoy. This is an anthology you should experience for yourself. 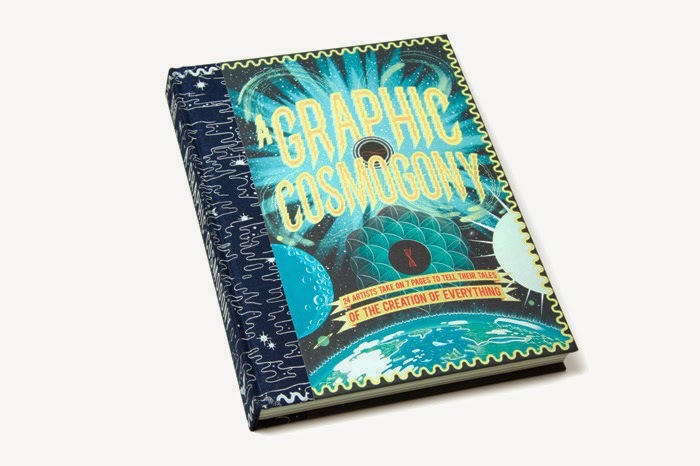 You can purchase A Graphic Cosmogony from Nobrow Press HERE.